Heathrow Airport is hardly an eatery, attraction, or activity in Oxford – which is what I normally review as Oxford Mommy – but it certainly acts as a portal to places where you might be enjoying all three of these. Since we have recently survived an international flight with the Baberoo and lived to tell the tale, I’d like to share my experiences of using the airport for the first time with a baby in tow. My advice in this post only covers Terminal 3, which serves mainly international flights (including Air Canada, with whom we were flying to my hometown of Ottawa). I can’t comment on any of the other terminals at Heathrow, and they may have different facilities depending on when they were built. Since I’ve always found Terminal 3 to be very crowded once you pass security, my advice is to spend some time in the pre-security area and try out the restaurants and facilities there before going through to the post-security area. (Obviously, don’t leave too little time before you get through security!) That’s what we did, and it was a pleasantly good experience with a baby. There are a few restaurants and cafes to choose from in the pre-security area, most of which have a goodly amount of space around tables for hand luggage. If you’re travelling with a stroller and are planning to check it at the gate (confirm with your airline beforehand if you’re able to do this), you won’t have any trouble manoeuvring it in most of the spaces in the pre-security area. The only restaurant that looked like it had less space around the tables was Leon; we tried out the Pret a Manger and it was very spacious. More important to me than the food was the availability and cleanliness of the baby-changing facilities. The ones in the pre-security section of Terminal 3 were a really nice surprise. I had thought that they would be so well-travelled that they’d be messy and that there might be a queue to use them. But it turned out that they were clean, spacious, and empty. (They’re also easy to miss, with a very small sign before the main gents and ladies’ facilities.) There are actually two baby-changing facilities in the pre-security section, one at each end of the area. We used the one nearest to the Pret. 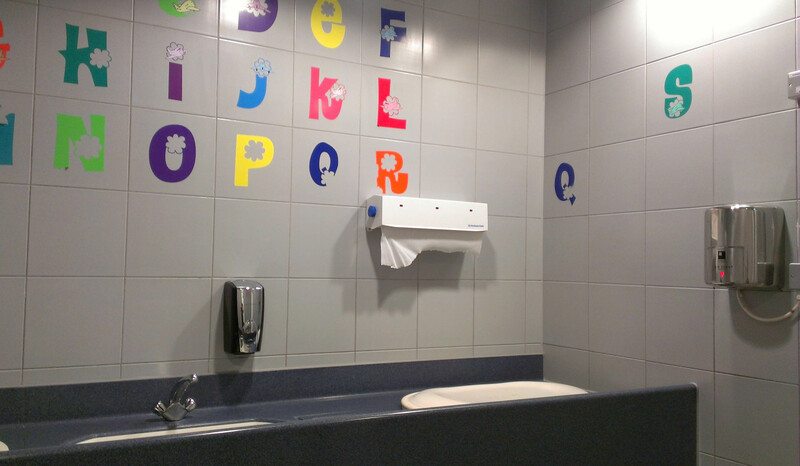 Although some of the decorations were peeling off the walls, the baby-changing area was otherwise impeccably clean, with a huge amount of space. It really felt like whoever had designed the room had thought of all the things a family might need when travelling with a baby. The baby-changing table is built into the counter rather than being a pull-down table, and there are two changing spaces (with one sink separating them) so that two families can use the changing room at the same time. There’s also a ‘family toilet’ in a separate small room so that adults can also use the bathroom, and another small room off to the side, containing a chair and some shelves, which I assume is a breastfeeding room for those who want privacy. 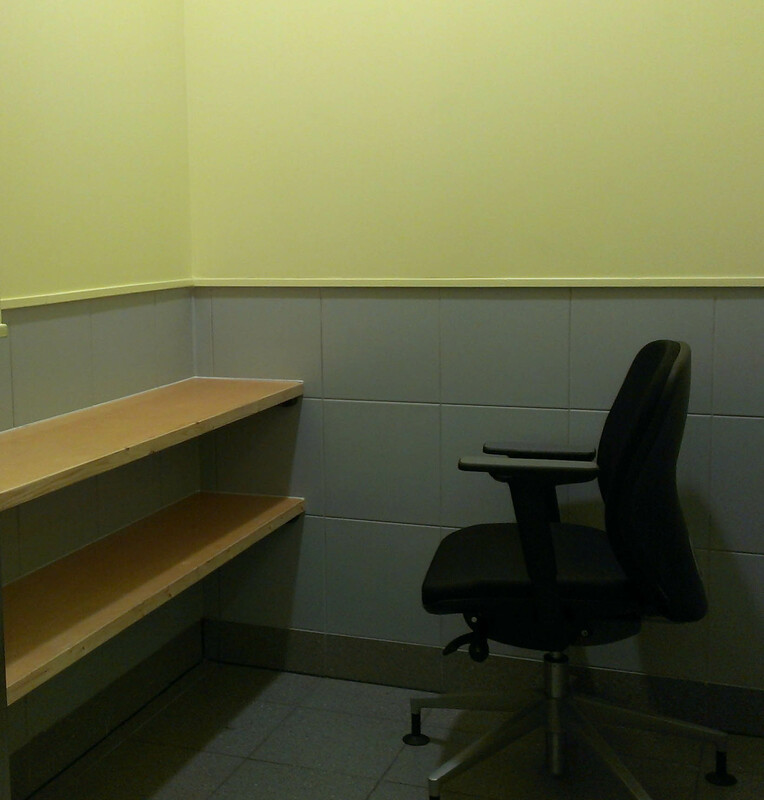 We were really happy with the facility that we used in the pre-security area. Once we passed security, we were lucky enough to have passes for the SAS/Air Canada Lounge rather than the regular waiting area (thanks to my frequent flyer sister! 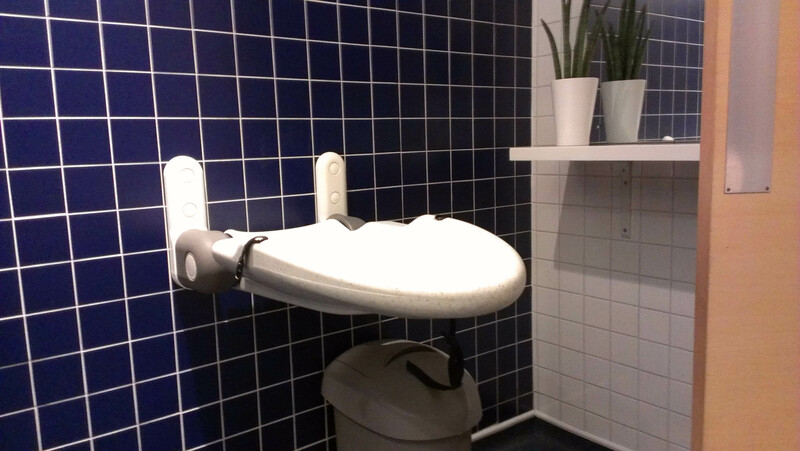 ), so we used the baby-changing facility there. It was not quite as well-thought-out: it looked prettier and was clean, but the changing table was the pull-down kind rather than built-in, and there was nowhere near the table to put a changing bag. It was fine, though, and it did the job. 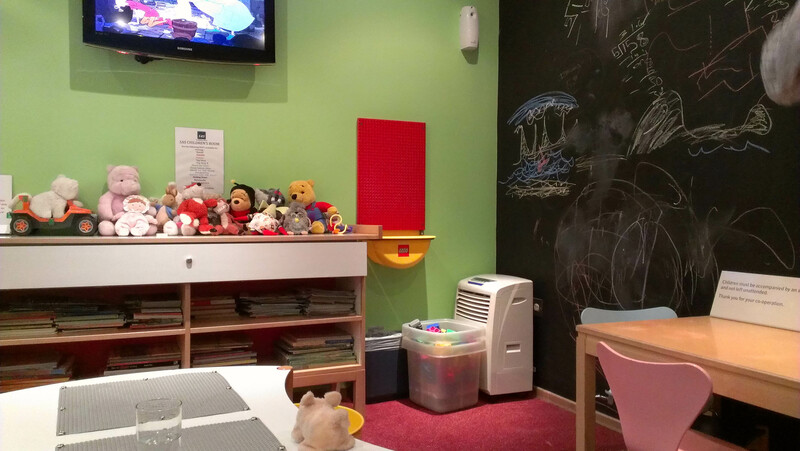 The SAS/Air Canada Lounge did have a huge advantage in baby-friendliness over the regular waiting area in the post-security section: there is a special kids’ room with a couch, toys, Lego table, colouring table, chalkboard wall, and wide-screen TV with a selection of DVDs to watch. We enjoyed using the room and I highly recommend a lounge experience if you are travelling with a baby, if you can get your hands on any passes or if you have any frequent flyer points to spend. There are eight lounges in Terminal 3, all for different airlines, so they will all have different facilities for babies. If you’re in the regular post-security waiting area, you’ll have a choice of several places to eat, most of which will have plenty of space for your baby accoutrements and hand luggage. My own recommendation is to find a seat in a relatively quiet corner of one of the eateries and stay there, rather than trying to find seats in the central seating section. If you’re flying with a baby, Heathrow Terminal 3 gives you some excellent changing facilities and a good amount of space to get around with all of your accoutrements and baggage. But it’s mainly up to you to entertain your little one(s) before getting on the plane. If you’re a first-timer like we were, best of luck!